Special INTERACTIVE ISSUE! Boxtrolls director Graham Annable's story "Spot the Differences" finds Squidward plagued by double images of SpongeBob--with 4 subtle differences to be found in each pair! Michael T. Gilbert (Mister Monster) crafts a SpongeBob mystery where you crack the case by holding up key panels to a light! And Al Jaffee (MAD) brings his folding-image skills to Bikini Bottom. 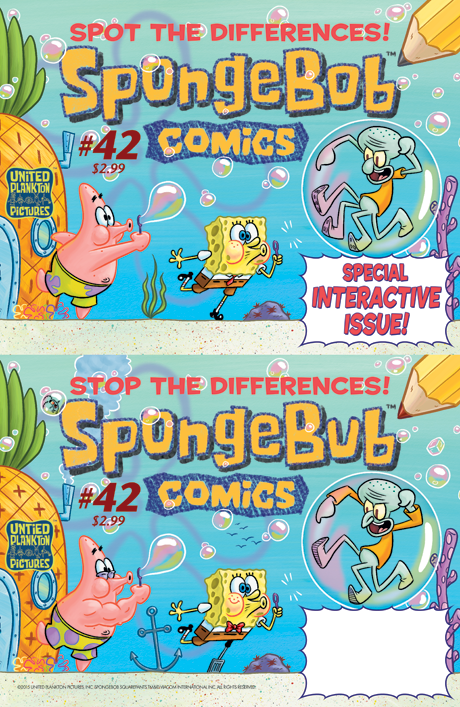 All this plus a crazy "SpongeFunnies," a branching tale of Patrick's neighborhood watch, and more!